Dr. Mitzvah was sitting in his yard enjoying the early morning sun. Birds were singing, children were laughing on their way to school, and inside the house Mrs. Goldengreen was cheerfully dusting. "What a lovely, happy day," he murmured. "Everything is sunny and smiley, just the way a day should be. I hope no one calls me today. I'd like to catch up on my reading." Just then, the phone rang very loudly. Dr. Mitzvah picked up the receiver and listened. He sighed. "Very well," he said. "I suppose I shall have to come." He hung up. "Mrs. Goldengreen," he called, "could you kindly prepare my travelling bag for me? And I think I shall need a saddle. Do I happen to have an old saddle somewhere?" "A saddle? Can't you use your bicycle? Besides, I thought you were going to spend the day in the garden, reading." "I thought so too," sighed Dr. Mitzvah again, "but my friends the Happy Sun Indians need me. It seems they aren't so happy or sunny anymore. In fact, the entire tribe is walking around under a cloud. They haven't smiled or laughed since it snowed last winter! Some of them are even crying. Imagine - Happy Sun Indians crying! I shall have to take a look and see what I can do. Did you find a saddle?" Mrs. Goldengreen didn't find a saddle but she did find a book she handed to Dr. Mitzvah. "Here," she said, "take this with you. It might help." Just then a rider and two horses were seen coming down Cobblestone Lane. Windows opened up, children cheered, drivers honked and waved. Indians on horses were not an everyday sight in Cedarville. "Is there a circus in town?" asked one excited little boy. "Naw!" said his brother. "It's probably another one of Dr. Mitzvah's friends. But he's the saddest looking Indian I ever saw. He looks like he's going to cry!" And indeed he did. He stopped at Dr. Mitzvah's house and waited for the doctor to put on his gray bowler hat and straighten his red dotted bow tie. He picked up Dr. Mitzvah's bags, and then picked up Dr. Mitzvah himself and sat him on top of the second horse. "It's a good thing you brought a saddle," said Dr. Mitzvah. "Mine seems to have disappeared." The Indian nodded and wiped a tear from his nose. All along the road, people saw the tall, feather-dressed Indian and the short bowler-hatted doctor. They smiled. Dr. Mitzvah smiled back. The Indian sniffed. At the reservation, two hundred gloomy Indians stood in a circle and waited for Dr. Mitzvah. Chief Happy Face began to cry. "Our medicine man is strong," he said, "but not strong enough to cure our sad-sickness. Perhaps your medicine can help." "Whatever is the matter?" asked Dr. Mitzvah. "You have always been the world's happiest Indians. You make everyone smile. What happened?" "Nothing," sobbed the Chief. "It's just that there are so many things we want but don't have. So many things to do which we can't possibly do. So many places to go that we'll never get to. It's just so very, very sad. So much to want and so little to actually get and have and do!" "I only have two outfits of clothing," said Little Eyes. "One for everyday and one for ceremonies. And I only have one horse. 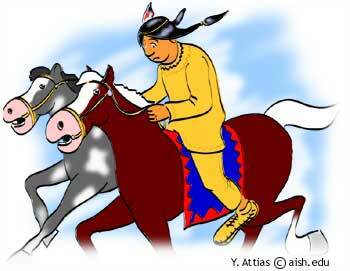 My friends in other tribes have five or six horses each! My clothes are always being washed and my horse is always tired. I need more clothes to wear and more horses to ride!" "I don't need clothes or horses," said Biggest Brother. "I want to sing in the opera but everyone laughs at me. They say I have no voice and I can't sing on tune. All I can do is play the drums and chant Indian music. It's so boring." "And I want to be an important leader, like Chief Happy Face. But I have no tribe to lead," complained Susan WindStorm. More and more Indians stood in line, each waiting to tell Dr. Mitzvah what they wanted and what they didn't have. When they were all finished, Mrs. White-Moon-Face asked, "How can we be happy if no one has what he or she wants?" Dr. Mitzvah pulled on his moustache and pushed back his hat. "My dear friends," he finally said, "the solution is simple. You must all want exactly what you have! If you aren't happy with what you have, all your moons will be spent crying and complaining and the sad-sickness will spread. Little Eyes should clean his clothing and take care of his loyal horse. Biggest Brother should practice his drums and chants. He is the best drum player and chanter in the tribe. Indian music isn't boring at all, and isn't he lucky that Indian songs don't have to be sung on tune? And Susan WindStorm is already an important Indian chief. She teaches all the tribe's children in school, and leads them after school and arranges and decides everything for the tribe's holiday celebrations. Why, without Susan, the Happy Sun Indians would never have a happy party or feast or celebration to go to!" "What about me?" asked Chief Happy Face. "I'm sad too." "Why are you sad?" asked Dr. Mitzvah. "Because everyone in my tribe is so gloomy and dismal and gray!" "Then let's make the gloomy gray all bright and shiny," said Dr. Mitzvah. "Let Little Eyes and everyone else prepare their best holiday clothing and brush the horses until they glow. Let Biggest Brother call out the drummers and the dancers and the band. Let Susan WindStorm organize a feast. And let's all get ready to give thanks for who we are and what we have. If each of us wants exactly what he has, no one will want anything else and everyone will be happy! And you will continue to be the smiley chief of the world's happiest tribe!" The next day, two hundred Sun Happy Indians gathered in front of their circle of wigwams. Drums beat, chants were sung, Indian's danced and ate and told stories and passed the Friendship Pipe from one to the other. Finally, Dr. Mitzvah held up his hand for silence. He took out Mrs. Goldengreen's book and began to read in a loud voice. The title of the book was: How to be Happy With Whatever You Have - 613 Funny Jokes for Unhappy Indians and Other People. When Dr. Mitzvah reached the last joke, Chief Happy Face was smiling brightly. "Ah," he said, "I was right. Your medicine is truly strong and good." "It's not my medicine," Dr. Mitzvah insisted. "Being happy with what we have is a mitzva, and all mitzvos are good, healthy medicine!" JUST PUBLISHED! Now you can read twelve wonderful Dr. Mitzvah stories by Yaffa Ganz, complete with bright, charming, full color illustrations in a brand new book designed just for young readers. Available from Feldheim Publishers. We have adopted Dr Mitzvah stories to our shabbat table and the kids love them! We often have several visitors with their children and we discuss Dr Mitzva at length! It is a great way to get the kids involved in conversation!! i heard about your website from a friend, so i decided to give it a try. so far it look great! hatzlacha! !